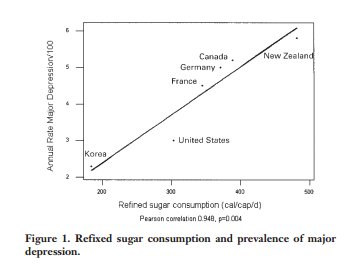 Last week reader panjoomby pointed me to an interesting study that correlated a countries sugar consumption to their rates of major depression. Apparently that gives a correlation of .948. Any time there’s a correlation that high, I’m going to get a look on my face that’s an interesting cross between curious and suspicious and that causes me to get wrinkles between my eyebrows. I decided to take a look around for the full study, and found a copy here. Basically the authors took data from the Food and Agricultural Organization and correlated them with the results from a 1996 paper by Weissman et al published in JAMA called Cross-national epidemiology of major depression and bipolar disorder. Only six countries were used for the correlation. The original study on depression, they studied 10 countries: Canada, U.S., Puerto Rico, France, Italy, West Germany (it was 1991), Lebanon, Taiwan, Korea, and New Zealand. They clarified that Taiwan and Puerto Rico had no sugar consumption data. Ultimately, their line consisted of Korea, France, Germany, US, Canada and New Zealand. West Germany and Lebanon were not mentioned. West Germany I presume something about it not existing any more, but Lebanon concerned me, as it was suggested it had very high rates of depression. When I pulled my own data from the FAO, it looked like Lebanon’s sugar consumption was similar to Canada’s. That would have change things a bit. The country anchoring the bottom of the line is dramatically culturally different from the other 5 countries. When I got my degree, I actually had to take an entire class on culturally sensitive counseling. In it, we were reminded how many mental health standards were written either by North Americans or Europeans and how they really didn’t fit some cultures very well. Asian cultures are notorious for under reporting symptoms, and for giving different names to things to avoid stigma. This was admitted by the authors to be a weakness, but looking at the chart makes you realize this correlation would not be nearly as good if Korea wasn’t in the mix. The only source of sugar they counted was sugar. The FAO reports honey consumption. And lots of fruits and date consumption. I get why you wouldn’t throw fruit in there, but it seems to me that there are a few other sweeteners that might change the numbers. Any hypothesis that posits that processed cane sugar can cause dramatic mental health issues should probably ponder what (if any) effect a different type of sugar could have, and if adding it in changed anything. I mean, they mentioned dates in their first paragraph for heaven’s sake. Every country on this list has to have a certain level of infrastructure to consume sugar and to be survey for depression. Sugar tends to be more abundant in countries that have more food. Countries that have more food tend to be better for researchers to set up shop in. Countries without either are not included. There’s some suggestion that quite a few poor countries might have really high depression rates thanks to malnutrition and otherwise terrible conditions. That would definitely skew the line, and raise more questions about poverty rates in the originally studied countries. yay! thank you for your awesome & thorough investigative work. bravo! i'm surprised the authors didn't recommend moving to Korea as a possible cure for depression:) it must drive you nuts when such articles get cited & then treated as gospel. as a prof, the worst research i ever did was picked up by USA Today (latchkey/drug use) & any decent research (lisrel-multiple regression-path analysis/lack of test bias) got read by maybe 5 or 6 people (sigh) – excellent work – if you had a tv show i would watch tv! You're welcome…I always like getting ideas for the blog. At this point, I am a terrible person to read news stories with because I get so worked up over improper use of statistics. Sorry about your papers…I've definitely found that what I think is my best work does not always line up with what others want to talk about!